The product analysts are always keeping an eye on how GOV.UK is performing, and I thought it would be interesting to share a milestone and some other data about user behaviour. 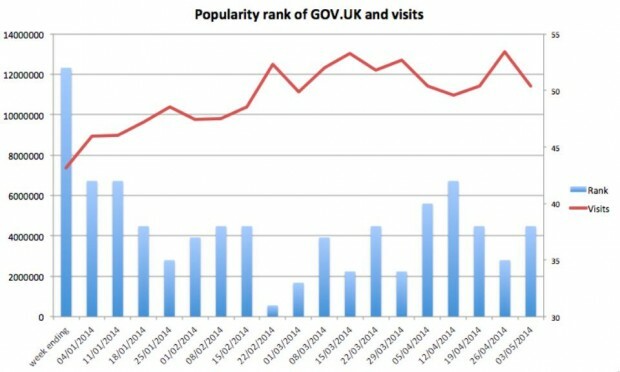 In March this year GOV.UK saw over 50 million visits in a calendar month for the first time. 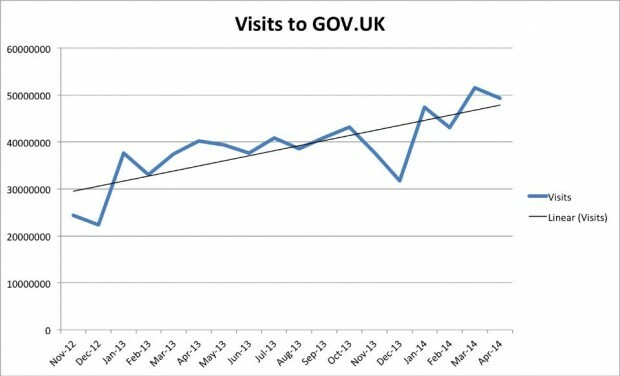 Visits to GOV.UK are on a steady upward trend - driven by strong optimisation in search and the transition of agency websites. But, you’ll notice the impact of holiday periods - Christmas and Easter - when people are clearly less inclined to interact with government. February dips, of course, since it is a short month. Experian Hitwise collects anonymous data about internet use in the UK. We use this to monitor the popularity of GOV.UK against all other web properties. Not surprisingly, there is a correlation between visits and rank. Again, when there is a holiday, GOV.UK’s visits and rank tend to dip - you can even see that in the last week’s data when Monday was a Bank Holiday. Of course, like any ‘league table’, GOV.UK’s position is also influenced by the performance of other sites. Its usual neighbours are banks, ISPs’ sites and some newspapers. Over the last 18 months, we've seen visits to GOV.UK from people overseas double from around six per cent of total visits to 12% in April. We only know that users are visiting from an overseas IP address, so we don’t know if they are foreign nationals or British people resident or on holiday abroad or in overseas territories. Ordered by raw volume, the top ‘nations’ visiting GOV.UK include USA, Russia and China, the larger European nations and countries with historical connections with the UK. But, after taking population into account the list switches to UK territories and dependencies, with the Isle of Man, Falklands Island and Guernsey topping the list. Keep a lookout for our data analysis posts on Inside GOV.UK and the GDS data blog. I'm trying to find your data on bounce rates, search exits and search refinements but finding it difficult. Can you send me to the right place? Hi - I have been holding out for some info on search performance but am still finding it difficult to locate. Do you publish, or can you share, data on the search exit and search refinement rate for Gov.uk? Congrats on making it into the top 40!